It is difficult for me to imagine an international relations (IR) scholar not being interested enough in Bear Braumoeller’s The Great Powers and the International System to read this review symposium. I’ll warrant that I’m biased on the matter, having been nurtured on systemic IR theory as an undergraduate and graduate student, liking books that combine rigorous theory and international history, and being interested in the substantive questions and specific historical periods discussed in the book. But those of you who may not share this background and disposition please consider these points: The Great Powers and the International System was selected as the best book of the year by the International Studies Association; it advances huge arguments with major implications for big swaths of international history; it grapples with questions that have exercised the minds of thinkers for centuries, primarily whether leaders shape or are shaped by grand historical forces; it generates non-obvious and counterintuitive arguments about questions long at the center of the field; unlike most ‘big swing’ theory books, it features a major effort to subject arguments to empirical account; if you like math, it’s got it—both for working out the theory and testing it; if you like to see abstract arguments that are expressed and tested with symbols and numbers forced to confront the real stuff of international politics in real case studies, it’s got that too; it is highly likely to become a central book in the field, informing a lot of subsequent scholarship; and, finally, to assess the book critically, H-Diplo’s ISSF editors have assembled here an academic dream team (more on that below). Bear Braumoeller. The Great Powers and the International System Systemic Theory in Empirical Perspective. Cambridge: Cambridge University Press, 2013. ISBN: 9781107005419 (hardback, $99.99); 9781107659186 (paperback, $29.99). As its title suggests, The Great Powers and the International System is an effort to revivify systemic theory—which is central to many sciences and other social sciences and once was much more central to IR than it is now. Yes, there are important works couched at the level of the international system—those by Alexander Wendt and John Mearsheimer, for sure, and, more recently, Charles Glaser and Nuno Monteiro come to mind. But these works take the cue from Kenneth Waltz and bracket out the domestic level. This reflects the outsized influence Waltz’s undeniably brilliant but deeply flawed work had on our field. Not only did it crowd out other scholarship of this type, but the decades of criticism it attracted also put large parts of the field off the whole idea of systemic theory. And the Waltizian division of labor between systemic theory and theories of foreign policy—while a helpful intellectual move in the broad sweep of the evolution of inquiry in IR—ended up generating an unhelpful division of labor. Too often, theories like Waltz’s or Wendt’s or Mearsheimer’s serve the role of useful foil for research at the dyadic level. ‘Look,’ the claim usually goes, ‘these dyadic patterns are inconsistent with my reading of this or that systemic theory.’ Rarely are such claims accompanied by more than cursory efforts to model ways in which system-level changes might be in play. Citations to these works cumulate. But does knowledge? Often there is no true integration of work across these different levels. Changes in observed patterns at the dyadic level may be (partly) the result of system level changes. At least, that’s what people like me often think. But is it true? It’s hard to tell if the systemic and foreign policy levels are not integrated in the theory in the first place. … that structural realism’s insights about the formation of balances of power do not follow from its premises, though they can be made to follow with some additional premises; that the argument that Great Powers will choose a more restrained policy as their relative power declines … does not follow at all; that purely domestic theories of foreign policy, such as those that explain American isolationism between the two World Wars, may have to be revised; and that the logic of socialization, occasionally discussed in the constructivist literature, might actually be linked to balances of power. The reviews that follow grapple with many of the book’s main claims. (They do not get into the mathematical details—they all appear to take Braumoeller’s prowess on that for granted.) The reviewers are ideally placed to provide insight: Michael Cairo has published work bearing on one of Braumoeller’s major cases, the Cold War’s end;  Michael Horowitz is part of a major project at the other end of the spectrum from Braumoeller, one that recaptures leaders and leadership as central in explaining state actions; and William Thompson is a major figure in an important systemic research program in international politics. Cairo situates the book in the broader IR debates, provides an excellent summary of its core approach, and critically evaluates its application to the Cold War’s end. Horowitz pushes Braumoeller’s theory, seeking to clarify its limits at several potentially vulnerable points: can leaders really be modeled as mainly just responding to citizen preferences? Does the theory apply to smaller states? How can it account for seemingly weak but hyperactive states that ‘punch above their weight’? And how well does the theory capture the real choices and dynamics surrounding China’s rise and the U.S. ‘rebalance’ to Asia? Thompson is the most skeptical and hits hardest at a question that vexes all the reviewers: What are the analytical trade-offs of starting with citizens’ preferences? For Thompson, this means that ultimately Braumoeller’s theory assumes Primat der Innenpolitk: the premise “that all foreign policy activities flow from domestic politics.” Perhaps this answers the field’s current infatuation with microfoundations, Thompson notes, but just because the conventional wisdom wants them does not make them necessary. You do not need microfoundations to integrate levels, he insists. Thanks in part to forums like H-Diplo’s ISSF, I have come to question the value of reviews without the author’s responses. Braumoeller’s rejoinder here helps make that case. It is strong, it clarifies claims, it pushes back, but it is constructive, shining light on the very interesting path forward this book has cleared. Bear F. Braumoeller (Ph.D., University of Michigan) is Associate Professor and Director of Graduate Studies in the Department of Political Science. He is or has been on the Editorial Boards of five major journals or series, and he is a past Councilor of the Peace Science Society. Professor Braumoeller’s research is in the areas of international relations, especially international security, and statistical methodology. His substantive research includes a book-length systemic theory of international relations, The Great Powers and the International System (Cambridge University Press; winner of the 2014 International Studies Association Best Book Award and the 2014 J. David Singer Book Award) as well as various works on international conflict, the history of American isolationism, and the problem of so-called “politically irrelevant dyads.” He is currently involved in projects on civil war onset, peacekeeping success, and the end-of-war thesis. William C. Wohlforth is the Daniel Webster Professor of Government at Dartmouth. He is the author or editor of seven books and some 60 articles and book chapters on topics ranging from the Cold War and its end to unipolarity and contemporary U.S. grand strategy. Recent publications include Status and World Order (Cambridge University Press, 2014) edited with T.V. Paul and Deborah Larson, and “Don’t Come Home, America: The Case Against Retrenchment,” International Security (Winter 2012-13), with S.G. Brooks and G. J. Ikenberry. His article “Nation Building through War,” with Nicholas Sambanis and Stergios Skaperdas, is forthcoming in the American Political Science Review. He is currently writing a book with Stephen Brooks entitled America Abroad The United States’ Global Role in the 21st Century. Michael Cairo is an Associate Professor of Political Science at Transylvania University. He received his Ph.D. in Foreign Affairs from the University of Virginia. He is the author of The Gulf: The Bush Presidencies and the Middle East (Lexingon, Ky: University Press of Kentucky, 2012) and a number of book chapters. His current project with the tentative title of “The Personal Politics of Peace: American Presidents, Israeli Prime Ministers, and the Peace Process” focuses on U.S.-Israeli relations spanning the Lyndon B. Johnson to Barack Obama presidencies with an emphasis on the critical role that a president’s personal beliefs and images can play in U.S.-Israeli relations. Michael C. Horowitz is Associate Professor of political science at the University of Pennsylvania. He is author of Michael C. Horowitz, Rose McDermott, and Allan C. Stam.,”Age, Regime Type, and Violence” Journal of Conflict Resolution, 49:5 (October 2005): 661-685, and Michael C. Horowitz, and Allan C. Stam, “How Prior Military Experience Influences The Future Militarized Behavior of Leaders,” International Organization, 68:3 (June 2014): 527-559. William R. Thompson is Distinguished Professor and Rogers Professor of Political Science at Indiana University, and, in 2014, a Visiting Professor at Moscow State Institute for International Relations (MGIMO). Most recent books include How Rivalries End (University of Pennsylvania Press, 2013, with Karen Rasler and Sumit Ganguly) and Transition Scenarios: China and the United States in the 21st Century (University of Chicago Press, 2013, with David P. Rapkin). Current projects include completing somehow five books underway on contemporary Indian state making, the European balance of power since the 1490s, U.S. rise and relative decline, energy transitions and their implications for world politics, and the relationships among domestic structures and processes (such as political legitimacy, state capacity, and ethnic heterogeneity) and inter- and intrastate conflict. In Agents, Structures and International Relations: Politics as Ontology, Colin Wight argues that “there is a way of thinking about International Relations (IR) that seems to saturate all theoretical discussion within the discipline. Although it can take different forms, the underlying logic of this mode of thought is simple to articulate: IR theory, so the argument goes, is structured by a set of deep epistemological (sometimes methodological) divisions that prevent the attainment of anything approaching an integrated body of knowledge.”  Chief among these divisions is the agent-structure problem. As Alexander Wendt makes clear, all international theories attempt to solve the agent-structure dilemma. At the heart of that dilemma is the debate over the primacy of agency or structure in shaping behavior. Simply put, agency is the ability of individuals or states to act independently and make their own choices, while structure is the recurrent patterned arrangements in the system that influence or limit the choices and opportunities available to states and individuals. Despite numerous attempts by scholars to bridge this divide, international relations theory has, until this point, failed to move beyond the debate itself. Bear F. Braumoeller’s The Great Powers and the International System Systemic Theory in Empirical Perspective accomplishes what no other scholarly work has effectively done by bridging the agent-structure gap and arguing for a truly systemic theory of international relations. Braumoeller begins this seminal work by addressing whether great leaders make history or are constrained by the circumstances under which they operate. He argues that “the combination of these two ideas—that environments have an impact on people’s behavior and that people act to alter their environment—is the essence of systemic thinking” (xiii). Braumoeller constructs a systemic theory of international politics, examining the international system as a whole. He does this by integrating agent-level and structural-level approaches to our understanding of state behavior, creating a single, unified, holistic theory, rather than a theory that only identifies one aspect of the international system as the basis for state behavior. To examine his theory, Braumoeller bridges a second divide within political science—the divide between quantitative and qualitative methodology. Offering an approach that uses both quantitative and qualitative methods, the book produces a strong, effective argument that is certain to alter the agent-structure debate in international relations. According to the introduction, the idea “that Great Powers are free to act, unhindered by external constraints; and that even the actions of Great Powers are dictated largely by circumstance … divides our understanding of international relations” (1). Arguing that there should be no winner in the agent-structure debate, Braumoeller constructs a theory that combines the characteristics of the states in the system with the nature of the system itself. At the center of the explanation are four interrelated points. First, citizens’ understanding of the world determines their wants in the international system. Second, the state channels these desires and conveys them to the leaders. Third, the ability of a leader to carry out citizens’ desires is limited by the capabilities of the state. And, finally, the relations of the states in the system with diverse capabilities and interests determine the nature of great power politics in the international system and the distribution of power. Braumoeller describes his theory as a nested politics approach in which sovereignty is “nested within hierarchy nested within anarchy” (16). The book proceeds by testing multiple hypotheses associated with his theory, both quantitatively and qualitatively. Braumoeller examines the hypotheses using three distinct yet historically significant cases: the post-Napoleonic European system, the period between the two World Wars, and the Cold War. More specifically, Braumoeller examines the polarization that occurred between 1815 and 1834, the end of American isolationism in 1940, and the end of the Cold War from 1985 to 1990. While the quantitative analysis presented in the book is sophisticated and quite convincing, the argument gathers strength through its qualitative case study analysis. In the quantitative analysis, Braumoeller applies a complex formulaic model, which not only demonstrates that agents and structures interact, but also undermines mainstream balance-of-power arguments. The model shows that the international system both shapes and is shaped by the security policies of states within the system. Moreover, he illustrates that a balance of political ideology, rather than a balance of power, is more important to the system. While the model is highly sophisticated, Braumoeller’s explanation of the model is succinct and clear, and those wanting more information about his methodological approach will be pleased to see that Braumoeller includes two appendices that provide the theoretical and empirical details of the model. Both appendices will prove particularly useful to those wishing to replicate the model’s results, or apply the model to new cases. In addition, they provide excellent material for analysis in a graduate-level course on methodology. The book next examines the cases by using a qualitative case study method of analysis. Unlike the quantitative analysis chapter presented in the book, the case study chapter provides a deep explanation of each case. The analysis of the post-Napoleonic system is the least interesting of the cases, but Braumoeller effectively argues that British liberalization preceded a conservative reaction within the international system, offering an alternative to many other analyses. More interesting are the cases on the ending of American isolation and the end of the Cold War. The author demonstrates that the perception of American inaction against Nazi aggression during the interwar period is false; furthermore, he shows that the United States reacted to tangible changes in the status quo of the international system through the interwar period but especially in 1940. Braumoeller admits that his final case is the most complicated, but in the end it is also the most compelling. He explains how Soviet premiere Mikhail Gorbachev’s policies aimed to transform the international system, but Braumoeller also illustrates how the United States failed to act until the transformation was clear. I am particularly compelled by this case, since my dissertation work focused on President George H.W. Bush’s worldviews and perceptions of Gorbachev and the Soviet Union at the end of the Cold War. As someone who has extensively studied Bush’s foreign policy, I am concerned that Braumoeller gives less attention to Bush’s preconceived worldview, which had important implications for American policy. This discussion would have strengthened Braumoeller’s argument about the reactive nature of American diplomacy. In general, however, the book not only makes a strong and convincing argument, but also anticipates and deals with various criticisms that one might raise about the argument. For example, one criticism that might be leveled at the book is that the nature of war and sovereignty in the contemporary world has changed and great-power conflicts are less significant to the system than they once were. Braumoeller addresses this issue in the book’s conclusion. While the author acknowledges that the “United States may therefore continue to pursue more direct means of countering terrorism …than via the strengthening of the sovereign state,” the problem remains that the premises of the theory are based on symmetrical rather than asymmetrical conflict. (198) Yet asymmetrical conflict may be more important in the future. Thus, a fuller explanation of the impact of the war on terror is warranted, but this may require some distance from the current period. A second issue arises when one considers the role of citizens within great powers, particularly with regard to the nature of citizens’ knowledge. The two modern cases deal with a democratic great power, the United States. While Braumoeller addresses the rise of China in the book’s conclusion and discusses the Soviet Union in the case focusing on the end of the Cold War, he does not sufficiently address how citizens’ worldviews are channeled through the state to the leadership in a nondemocratic great power. Moreover, even in the United States, the idea that citizens’ views are clearly articulated and channeled to the leadership is problematic. As Stephen Earl Bennett and others have shown, citizens learn about foreign affairs through opportunity, social status, and their motivation. Furthermore, it is a well-documented finding that citizens know little about current events in general and even less about overseas events. Thus, further exploration of the role of citizens’ knowledge in the articulation of worldviews, as well as an understanding of which citizens’ worldviews have an impact on state policy, is warranted. While citizens may be important to an understanding of great power politics, it appears that an elite group of citizens matters more than the rest of the citizens. Much of Braumoeller’s argument depends on informed citizenship; what happens when citizen demands are ill-advised, unwarranted, manipulated, or simply misinformed? A more interesting issue for further research is analysis of the role of nested politics within the state. Braumoeller has effectively demonstrated that citizens’ worldviews can shape state behavior, but how does state behavior shape the views of citizens? In the case study on the end of the Cold War, Braumoeller begins to explore this with his analysis of the shift in the Soviet Union and the role of Gorbachev, but this is an area for further research. Another issue for further analysis involves the role of allies and alliances in systemic theory. 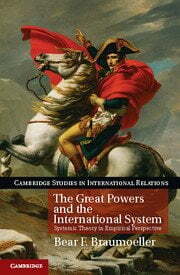 The book’s focus on great powers excludes the impact that their allies can have on shaping their behavior. For example, during the end of the Cold War, it is difficult to deny the impact that British Prime Minister Margaret Thatcher had on American policy. Moreover, allies had a particularly important role in German reunification. Do allies and alliances offer another form of nested politics within systemic theory? Finally, Braumoeller’s book is deep and complex. While not a criticism, this does mean that the book may not be accessible to all individuals. It is particularly suited for graduate students and scholars, and offers little utility for undergraduate courses or laypeople. Despite these minor issues, Braumoeller has established himself as one of the great international theorists of our age and should be commended for his highly sophisticated and intellectually articulated treatise. At the same time, it is a book that is sure to become an instant classic in the field of international relations. Bear Braumoeller’s book, The Great Powers and the International System: Systemic Theory in Empirical Perspective, is a truly exceptional system-level exploration of international politics. The book features the careful thinking, in-depth modeling, and extensive research that characterize Braumoeller’s work in general. It is important to recognize at the outset that this book represents a significant accomplishment. To begin, Braumoeller argues that much of what scholars tend to think of as system-level theory is actually structural theory focusing on the international system to the exclusion of other attributes (13). He proposes a new, integrated theory of the great powers and their behavior in the international system that begins at the level of the citizen and citizen worldviews concerning the status quo, progresses through the state and the actions of leaders, and ends with the interaction of states and the results for the international system (17). There are several things I really like about this book. First, using surveys of historians to measure foreign policy activity (among other things) on the part of great powers throughout different periods of European history is an extremely novel way to get at empirical evidence in favor or against the predictions of system-level theory. Since, as Braumoeller notes, a system-level theory does not make specific predictions on the outbreak of war or the formation of alliances, measures of broader categories of activity are necessary. Second, Braumoeller also makes a tremendous point about the relationship between realist theory and the balance of power. One powerful conclusion from his model showing how states that are focused on trading might behave similarly or differently than states focused on military power is that while realist causal mechanisms are one way that balances of power can emerge, they are not the only pathway. That is to say, evidence of power balances is not evidence in favor (or against) realism. Rather, a stable balance of power can emerge in multiple situations with states that have different beliefs about the world. Reading the book did raise several questions for me, however, about Braumoeller’s argument, as well as ways he might be able to extend it in the future. First, what might Braumoeller’s theory have to say about smaller states, e.g. the vast majority of states in international politics? His theory is set up to explain system-level variation driven by great powers, but a great deal of foreign policy activity is unrelated to great powers, of course, and certainly to interactions between great powers. Would Braumoeller’s theory apply to regional distributions such as the Middle East, or help us understand the foreign policy activity of a country such as Canada? One of value-added aspect of Braumoeller’s book is that it provides a theoretically coherent explanation for the puzzle of states with large amounts of economic power and extensive interests, but who do not seem extremely active from a foreign policy perspective and certainly not in the military realm. Brazil today, or more famously, Japan in the 1980s, come to mind. Braumoeller can explain their behavior, presumably, as characteristic of states that have a high degree of satisfaction with the international system and thus do not see the need for expansive foreign policy, and especially military activities. Yet, what about countries that seem to punch above their weight in international politics? For Braumoeller’s theory, these countries are arguably aberrant. He writes that “how much impact the state’s activity will have on the structure of the international system depends in a straightforward manner on the resources that it can bring to bear in an attempt to change the status quo” (42). Prince Klemens von Metternich’s Austro-Hungarian Empire is potentially an example of this phenomenon. Metternich’s diplomatic maneuvering, according to standard histories of Europe during that period, helped keep the Austro-Hungarian Empire afloat as a great power even as its true latent power was in decline. Another case might be North Korea over the last generation. By most economic metrics, North Korea is far from a powerhouse, and its conventional military arsenal is aging. Yet, North Korea remains a hugely important actor in the Asia-Pacific with an effect on the balance of power that outstrips how most would think of its relative power (measured in any way) due to its acquisition of nuclear weapons. One possible answer to this question might be that these countries have or had high levels of realized capabilities, but lower levels of latent capabilities, so they could or can only protect their interests, not change the structure of the status quo. But they were or are able to hold off much more powerful actors who, according to Braumoeller’s theory, would be more able to change the status quo. If we generalize matters, one question for Braumoeller becomes how long a state would have to punch above its weight before it would present evidence against his argument? Second, one interesting conclusion of Braumoeller’s theory, as his discussion of the U.S. response to Nazi Germany illustrates, is that states do not really engage in much long-term forecasting when it comes to the international system. Braumoeller argues that the U.S. was not indifferent to the rise of Nazi Germany, it just did not view Germany as a threat to key American allies in Europe. When that changed, after the invasion of France, American public perceptions changed as well (142). This is interesting because, arguably, the invasion of Poland, if not German actions before the invasion of Poland, certainly demonstrated Germany’s military might. While Braumoeller argues that Germany’s arsenal was perhaps shallower than many thought in the late 1930s (138), why did American leaders and the public fail to see the trajectory that Germany was on and accurately forecast that Nazi Germany would threaten France and Great Britain? Braumoeller is technically correct from a system-level perspective that the United States confronted Nazi Germany after it changed the international system (by conquering France, thus fundamentally disrupting the European balance of power). However, the same analysis of French military power that Braumoeller conducts of German military power, suggests that, at best, a conflict between Germany and France would have been a closely fought affair (of course, it was a runaway German victory). Why, then, would that disruption to the balance of power not have been more predictable, at least dating back to the conquest of Poland? Understanding more about how, in Braumoeller’s theory, states make these types of calculations (beyond the notion of threats being based on capabilities and intentions) would be welcome. Third, Braumoeller’s theory makes very particular assumptions about the importance and motivation of political leaders. For Braumoeller, leaders prioritize staying in office above other goals and are fundamentally constrained by the beliefs of the citizens whose support keeps them in office (34). Braumoeller recognizes that the relative importance of leaders may vary across regime type. In particular, leaders of more authoritarian regimes generally are responsible to a smaller set of citizens, making it easier for them to drive policy (35). Leaders also have the ability to attempt to shape the preferences of the citizenry, although this is difficult (35). Braumoeller empirically addresses the circumstances under which leaders can have greater influence over their surroundings in two different places. First, Braumoeller references Hitler’s “pathological worldview” as an exogenous shock, so to speak, that influenced Germany’s trajectory (193). The takeaway is supposed to be, however, that Braumoeller’s systemic theory accurately predicts the U.S. response to Nazi Germany despite the uniqueness of Hitler. Second, Braumoeller discusses the end of the Cold War and the policies promoted by Soviet leader Mikhail Gorbachev. Braumoeller argues that while Gorbachev did play an important role in ending the Cold War, that was only possible due to a series of shifts in the underlying Soviet and the worldview of many Soviet elites that his theory predicts (150). Yet this may underplay the relevance of leaders in international politics, especially when it comes to foreign policy decision-making. Research that Allan Stam and I have done, along with Rose McDermott, suggests that variations in the age of leaders and the military experiences of leaders fundamentally influence the probability that states start international conflicts. Now, to some extent, leaders certainly reflect the preferences of the underlying electorate in some way, but leaders are rarely selected based on foreign policy. The George Bush versus Al Gore election of 2000, which arguably had significant consequences for U.S. national security policy, is one example of that phenomenon. Moreover, sometimes leaders do not always behave in ways that maximize their chances of staying in office. In the War of the Triple Alliance in South America, for example, which took place from 1864-1870, Paraguayan President Francisco Lopez had several opportunities to fold what had become a losing hand and maintain his grip on power, but instead he chose to double down and keep fighting, ultimately bringing ruin to his country and losing his life. Fourth, Braumoeller’s extension of his theory to cover the rise of China is particularly relevant given the United States’ attempts to rebalance its foreign policy towards the Asia-Pacific over the last several years (recent crises in Ukraine, Iraq, and Israel notwithstanding). Appropriately hesitant about the accuracy of long-range forecasts when it comes to a country such as China, Braumoeller argues that the relative effect of U.S. foreign-policy activity on the balance of power with China will depend on China’s choices – a hardline Chinese regime less interested in accommodation will almost always end up as more powerful, in Braumoeller’s model, than one that accommodates. What also emerges from this application, however, is the insight that expanding China’s interests in the international status quo, a key goal of U.S. strategy with regards to China for a generation, if it succeeds, is likely to help maintain a more pro-American balance of power. Essentially, in Braumoeller’s model, the greater the stake China has in maintaining the international system, the less it can invest in simply shifting the balance of power, and the United States does not have to carry the burden of maintaining the international system on its own. This is well and good, but feels a bit hesitant – it is not surprising, after all, to find out that the level of effort the U.S. spends in maintaining its relative position via-à-vis China will be important. Yet, Braumoeller’s system-level argument about foreign policy activity is arguably well suited to speak to the potential effects of the rebalance, because the rebalance is supposed to be a whole-of-government approach, not just about shifting around U.S. military assets. Thus, one future application might be for Braumoeller to use his theory and predict how the rebalance to the Asia-Pacific might influence the balance of power between the U.S. and China. Braumoeller’s model concerning the U.S. and China also raises some questions, however. In an attempt to show the second-order effects of competition between the U.S. and China on issues such as democratization around the world and nuclear proliferation, he argues that growing competition between the U.S. and China would lead to more U.S. foreign policy activity in general, initially leading to greater success in these other areas (208), followed by reductions in success as US foreign policy activity declined due to success. Yet, this seems to raise two questions. First, why would competition with China lead to increased U.S. foreign policy activity in support of non-proliferation activities? It is possible, but far from obvious, that this is true. For example, one could imagine a world (an extreme world, to be fair), where increasing security competition between the United States and China led the United States to be more supportive of U.S. allies and partners in the Asia-Pacific who wished to acquire their own nuclear arsenals. Those arsenals would help the countries protect themselves from China, thus freeing up U.S. resources to be spent on more direct competition with China. In this case, security competition could lead the U.S. to actually shift its goal concerning non-proliferation, encouraging proliferation in one case. Additionally, one could also imagine a world in which security competition with China led the U.S. to place a much lower level of emphasis on the Middle East, including non-proliferation initiatives in the Middle East. The military and diplomatic resources the United States would devote towards that kind of competition might be tangential, at best, to achieving U.S. non-proliferation goals, especially outside of Asia. It is especially unclear why foreign policy activity, for Braumoeller, cannot be differentiated between spheres of action, in recognition of the fact that the need to focus in one area might lead to lower levels of effort – or even the abandonment of a priority – in another area. One could similarly imagine U.S. foreign policy activity with regards to democratization or terrorism (the other pieces in Figure 5.6, p. 207) declining in response to a new Cold War with China, because the resources the United States would invest to keep up with China would be unrelated or even counterproductive to those other priorities (one example of this might be the different types of military capabilities likely most useful for counterterrorism operations versus high-end warfare). It would be useful to understand where this assumption comes from, why it is necessary, and how things look if it is relaxed, as it might be in a real world situation. Second, why does success for the United States, as foreign policy activity increases, lead to an eventual reduction in success (because U.S. activity decreases, due to success)? Take democratization – suppose increased U.S. foreign policy activity led to a new wave of democratization and the consolidation of several democratizing states. In that case, why would we expect a reduction in U.S. efforts due to success to lead to backsliding? One could imagine, in theory, those regimes backsliding if they were not fully consolidated as democracies, but that requires an additional assumption (that democratization in a given regime varies linearly). It seems just as likely, though, that success on the part of the United States would not necessarily lead to a decline of activity and then failure, but rather a decline of activity and then no further change. Further explanation from Braumoeller might be especially helpful on this point, because this seems like an awfully strong assumption. At the end of the day, these issues and concerns pale in relation to the Braumoeller’s achievement in writing this book. This is an excellent book that significantly adds to our understanding of international politics. Bear Braumoeller’s The Great Powers and International System: Systemic Theory in Empirical Perspective is an interesting and rich contribution to the study of empirical and international politics. It is rich in the sense that it offers something fairly novel to contemplate. It is also complex. Braumoeller’s book is not the type of book that can be skimmed, read quickly, or even read only once. The genuinely intrigued reader will need to double back and reread earlier passages from time to time. The richness and complexity is accompanied by several foci: new theory, qualitative and quantitative assessments of the theory, and a microfoundation for examining systemic processes. None of these three foci is simple, nor are any of them problem-free. The theory’s utility is debatable. The tests are less than conclusive. The microfoundation may not be very compelling for all readers. But these are hardly fatal problems. They give us something to think about just as they press readers to see if their perceived flaws can be improved upon. Each of these issues deserves separate treatment. First, The theory has a number of variables but can be stated parsimoniously. Constituents make demands of their political leadership based on preferences, issue salience, and levels of dissatisfaction. Leaders wish to keep their positions and, therefore, implement constituent demands, subject to the capabilities available to their respective states and the actions of other states. The net outcome of all the state leaders implementing constituent demands impacts systemic structure. Then we return to the question of whether system structure corresponds to constituent preferences. A number of questions come immediately to mind. Do we know who the constituents are? How might we proceed to measure their preferences, issue salience, and levels of dissatisfaction? Do we have much evidence that state leaders respond to constituent demands, or are they more likely to shape them? Are all international relations centered in domestic politics? What does it really mean that implementation is subject to the constraints of one’s own capabilities and the actions of external actors? Of course, one of the attractive features of theories is that we do not have to test every facet of a theory as long as we can derive interesting generalizations. Yet it is also fair to ask whether the components of the theory are all that compelling? Only if we take the extreme position that it does not matter whether a theory’s assertions are very realistic and that what matters is whether its deductions are useful, can we gloss over the face value of the principal generalizations. Often, we encounter problems in identifying whose preferences are being privileged by a state’s foreign policy. Did the United States go to war in 2003 because it wanted to keep oil flowing into the world economy, gain access to oil wells to improve the profit lines of oil corporations, pre-empt a third-world weapons of mass destruction program, punish Iraq for aiding terrorism, or get even for an assassination attempt on the Chief Executive’s father? The arguments for and against these five possible interpretations are not equally appealing. But that is not the point. Each of the five links to a different constituency. How do we know which constituency is the right one? Or, what if the motivations for foreign policy behavior are multiple? Does that imply multiple constituencies are at work or that some constituencies have multiple preferences, or possibly both? For that matter, whether one thinks that the 2003 event was heavily manipulated to shape constituency demands or preferences depends, naturally, on who one thinks the constituency was in that case. Granted, theorists have to start somewhere. But one wonders whether the constituency-leader starting point is there largely for microfoundation purposes. Would the way the theory works be much different if, instead of constituencies, governments had preferences, issue salience, and levels of dissatisfaction? Is it reasonable, for that matter, to assume that all foreign policy activities flow from domestic politics? This theory definitely privileges agency over structure. That is probably a popular assumption and the current widespread appeal of agency über alles helps explain why the systemic level of analysis has been eclipsed by lower levels of analysis (international, national, group, and individuals). Systems cannot act, only individuals can choose to act. At the same time, we know that individuals cannot do as they please. Presumably, structures can constrain their behavior. So, too, can state capabilities and other states’ behavior. The point here is that a focus on a state’s resources and what others might do omits systemic structure as a possible constraint. Small, weak states cannot usually play hard ball with major powers. State A may block state B’s initiative (or implementation of its constituent demands). Neither consideration necessarily acknowledges the existence of a system or its structure. Yet the subtitle of Braumoeller’s book highlights that the work is one of systemic theory. If it is, it would seem to be systemic theory without a system (other than a residual structural target at the end of the causation chain). A third problem is that asserting that implementation is constrained by capabilities and other states remains a considerably open-ended statement. Is it asking too much of a theory to want to know how capabilities and other states constrain state behavior? After all, this arena of constraints is the very heart of international politics. Perhaps we need another (or an auxiliary) theory to fill in this black box? Or, is the problem that there are so many different types of foreign policies that only very generic statements can be made at the base theoretical level? If so, then auxiliary arguments will be necessary, depending on the nature of the topic. Very much to his credit, Braumoeller is not content to theorize. He tests his argument quantitatively and qualitatively. The quantitative test is based quite creatively on historian judgments about power distributions, preferences about power distributions, and levels of activity. Other variables, such as capabilities and ideology (proxied by regime type), are also added. The author compares three conventional periods: the long nineteenth century, the interwar years, and the Cold War. The results, not always easy to follow, appear to support the theoretical argument, with capabilities and ideology both mattering variably over time. However, one cannot help but wonder how the reliance on Correlates of War indicators (which tend to even out the differences between great powers by combining measures that emphasize overall size and economic performance) influences the quantitative outcome. If one flattens the material capabilities involved and accentuates the ideational differences via regime type, should we not anticipate some operational boost for the role of ideational factors? Braumoeller emphasizes, for example, that Britain moved away from the other great powers ideationally in the early ninteenth century but Britain also moved away from its competitors in terms of industrial and naval capabilities. Unless we capture all of the dimensions of positional differentiation, it is not clear how to interpret the differences that do emerge. Something similar must be said about the case studies that are developed for each of the three time periods. The book portrays the nineteenth century as a liberal-conservative contest. The interwar years focus on the emergence of the United States from ‘isolation.’ The Cold War case emphasizes the end of the rivalry. Space does not permit saying much about the case studies which take up about a third of the book. Suffice it to say that each case is susceptible to alternative interpretations. Perhaps that is only natural, but in these cases the alternative interpretations make you wonder about the utility of the theory developed by Braumoeller. One quick example is the interwar case of increased activity on the part of the United States. Braumoeller has the United States responding to the rise of Nazi Germany and, particularly the fall of France, by increasing U.S. unofficial participation in the Atlantic war theater. This increased activity is described as a response to increased public opinion concern about the structural implications of changes in European capabilities. Yet did not President Franklin D. Roosevelt increase U.S. participation in the European war far ahead of U.S. public opinion? Did not full U.S. participation in the European war revolve around the contingency of Germany declaring war on the United States after Pearl Harbor? What if there had been no Pearl Harbor and Japan had attacked the Soviet Union instead? I do not mean to raise contingencies and counterfactuals as obstacles to theory construction and assessment here. But in this case, there appear to be major limits to a U.S. implementation story driven by constituent demands and the U.S. response to the fall of France. It almost goes without saying that most political scientists prefer microfoundations. The quick answer to the decay of systemic theory in international relations is that it lacked said microfoundations, and without any appropriate grounding, such theory could not be expected to perform very well. But majority preferences are not always right. Braumoeller’s book provides one microfoundation. Those seeking a microfoundation should consider its fit and appeal. But, as one who has pursued systemic questions for a number of decades, it has never been clear to me why all systemic theory needs a have a microfoundation. We can certainly create theories about the balance of power, power transitions, and power concentration without microfoundations. Various macroprocesses interact. The old chestnut of polarity and stability is one example. Surely, we can create theories of how these macroprocesses might interact and still call them theories even if they lack microfoundations. At the same time, it is probably true that theories that span multiple levels of analysis should be more appealing than theories that are restricted to only one. Perhaps one of the main theoretical problems of international relations has been more one of artificially restricting ourselves to one level of analysis at a time than it is starting with a microfoundation. Braumoeller does make occasional references (see especially 47-66) to how his approach might improve or negate extant systemic theories but it would probably require another book to make the case fully. What one would have to do is to construct comparable arguments with and without microfoundations and see how the derived hypotheses perform in dealing with the same questions. It could be that the microfounded versions would win this theoretical tournament and then again, perhaps not. It should be an interesting contest when or if it is undertaken. My review has been critical but I do not wish to end on a sour note. Braumoeller’s book is definitely worth reading and considering. Ideally, it will provoke others to rise to the challenge to create more systemic theory. The author of this book has already risen to the challenge. Hopefully, he and others will keep at it. Writing reviews, especially critical ones, is generally a thankless task. But the opportunity to have one’s work dissected by such prominent and outstanding scholars is a rare treat, and it is one for which I am very grateful. I am also immensely grateful for the nice things that they wrote about the book, of course — more, probably, than they will ever know — but the interesting discussion revolves around the many critiques and questions. Probably the most prominent of these are the issues raised by Professors Michael Cairo and William Thompson regarding the role of constituencies in the model. Cairo wonders whether the idea of a constituency is meaningful in an authoritarian system; Professor Thompson offers an array of difficulties, from the difficulty of knowing which parts of a constituency are most important to measuring their preferences to the question of whether leaders might shape, rather than respond to, constituents’ opinions (as, arguably, with President Franklin D. Roosevelt prior to World War II). So the possibility that leaders will influence their constituencies is not really debatable — it clearly happens sometimes, and it happens a lot less at other times. The real question is, what do we do with this insight? How should a theory of systemic politics accommodate indeterminacies like this one? It seems to me that there are three possible answers. One, the theorist can go with the best assumption possible — that is, one that gets the relationship between leaders and constituencies right most of the time. Two, the theorist can specify what it is about a country, or a form of government, or a leader, that makes it more or less likely for that leader to influence public opinion rather than vice-versa. Three, the theorist can deal with each case on its own terms and not attempt to generalize. I chose the first option in this instance because I thought the claim that constituencies influenced leaders did the least violence to the facts, because I didn’t have a very clear idea of why some leaders have more influence over their constituencies than others, and because I did not want to abandon the enterprise of theorizing entirely. It is important to underscore a point that I made in the book about models and how I see them. To my mind, models should be useful guides to thinking about how the world works. They should be as useful as reality permits. They should not be straitjackets. I see the model at the core of the book as a foundation to build on in understanding any given case. The statistical tests show not that it is perfect, but that it generalizes reasonably well across Great Powers and across nearly 200 years. I do not think it will perfectly describe any single case; social scientists just are not that lucky. Once I used the statistical tests to establish that the basic model constitutes a reasonable generalization, I use the case studies both to check the microfoundations of the theory and to highlight idiosyncratic (or perhaps idiographic) deviations from the model’s assumptions and predictions. The theory is meant to act as the skeleton, and the history is meant to act as its flesh. So, to return to the point, it is very clear to me that leaders do influence their constituencies at times and that this fact is crucial to understanding the end of the Cold War. Were I to seek to explain only that case, reciprocal influence between constituency and leader would be essential. But theories must generalize. If there is a better generalization about how constituencies and their leaders interact to create policy, I am open to it. I do not, however, have a good defense against Cairo’s point that I failed to take into account the subtleties of President George H. W. Bush’s worldview. In looking over the case study again, I realize that I focused almost exclusively on President Ronald Reagan and Gorbachev, and the Bush who emerges from the literature review was pretty one-dimensional. This theory definitely privileges agency over structure. … Systems cannot act, only individuals can choose to act. At the same time, we know that individuals cannot do as they please. Presumably, structures can constrain their behavior. So, too, can state capabilities and other states’ behavior. The point here is that a focus on a state’s resources and what others might do omits systemic structure as a possible constraint. … Yet the subtitle of Braumoeller’s book highlights that the work is one of systemic theory. If it is, it would seem to be systemic theory without a system (other than a residual structural target at the end of the causation chain). Cairo’s question about how alliances could be taken into account is far clearer but infinitely more vexing. Alliances are, I think, far more complicated phenomena than most scholars recognize. There are secret alliances, which confound any argument that alliances are meant to deter or compel behavior by third parties. There are alliances whose goal it is to prevent coalitions rather than form them, as with the 1887 Reinsurance Treaty between Germany and Russia. The more I learn about them, the less I think I know about alliances. So although I think alliances probably matter, I am at a loss to come up with a useful generalization about how they do so. I have so far neglected Horowitz’s commentary, which is unfair given how much I enjoyed grappling with it. Horowitz asks, first, whether the model would scale to subsystems. It certainly could, though it could be hard to isolate those subsystems empirically. The problem would resemble an attempt to study the motion of a planet and its moons, when they are all influenced by the masses of the other planets and the sun. Such a study would be viable to the extent that the additional influence could either be accounted for, theoretically and empirically, or ignored without much cost. The former is a pretty daunting task, and the latter might work in some circumstances. The proof is in the pudding. The issue of states that ‘punch above their weight’ is a really interesting one. The formal theory assumes that a state’s punch is directly proportional to its weight, for the same reason cited above: the assumption may not be right in every case, but again, it was meant as a reasonably good starting point, not the last word on the subject. The empirics allow us to relax that assumption by putting coefficients on the terms that translate effort into outcomes. Unfortunately, there is no meaningful way to calculate a separate coefficient just for capabilities, so we cannot get at the question of which states punch above or below their weight. But the coefficients do give us the opportunity to answer Horowitz’s question about how long a state would have to punch above its weight before it would present evidence against the argument: the statistical tests simply are not set up to falsify the theory on that basis. A parallel example from American politics might be illustrative: if we theorized that women are more apt to vote for Democratic candidates in proportion to their education, but it turns out that some women are actually vastly more likely to vote for Democratic candidates than their level of education would suggest, how many of those women would we need to see before we would count the theory as falsified? Most likely, we would not really think about the problem that way. We might try to figure out why the women are so much more likely to vote Democratic, and that would probably be an interesting study in its own right. But we probably would not falsify the theory because the variables we have implicated have a bigger impact in some cases than in others. That said, the statistics are set up to falsify the theory if states systematically punch under their weight — that is, if capabilities do not usefully translate into outcomes. If that were the case, we would expect to see that the signs of the coefficients on the aggregate terms in the model would be in the predicted direction only about 50% of the time. The Fisher’s sign test on page 95, which is designed to calculate the probability of observing a given number of correct sign predictions if the probability of a correct prediction were really 50%, checks exactly this possibility. The question of why leaders and publics did not accurately predict the rise of the Nazis in Germany is probably one that H-Diplo readers are better qualified to discuss than I am. I can only note that when I took a close look at Nazi Germany’s material capabilities, I was more than a little surprised that it had managed to defeat the French. I confess, I probably wouldn’t have predicted it myself at the time. It does, however, raise the larger question of why I argue that publics and leaders in general are not very good at making predictions about what is going to happen in the short term. Exploring and explaining the ability of experts to predict outcomes is one of the most fascinating areas of research in political science, following Philip Tetlock’s groundbreaking contribution, which, among other things, found that that ability was on the whole quite poor. Indeed, Tetlock, Michael Horowitz, and Richard Herrmann connect that literature to systemic theory by demonstrating that awareness of systems effects can help experts to improve their ability to predict. Based on those conclusions, I suspect that part of the reason for poor prediction lies in an absence of systemic thinking on the part of elites. My own reason for choosing a myopic, partial adjustment model at the time I wrote the book, however, is largely empirical: I tested for the sort of contemporaneous coadjustment that one would expect to see if states were acting in an even minimally forward-looking manner and found very mixed results (96-98). Horowitz’s point that the book underestimates the relevance of specific leaders is an especially interesting one. As he points out, his own research indicates that age and military experience are significant predictors of whether or not leaders will resort to the use of force. I wasn’t able to use the results of that work in the book because the predicted outcome is not the use of force: while I do predict levels of state activity in general, I make the argument that systemic theory, on its own, cannot make predictions about the specific form that that activity will take. I do, however, connect the systemic theory to two dyadic theories, the deterrence model and the spiral model, to predict the occurrence of militarized interstate disputes in a separate project. A similar exercise using the characteristics of leaders would be a very interesting prospect. I’ve contacted Horowitz, and we plan to explore the possibilities. It is especially unclear why foreign policy activity, for Braumoeller, cannot be differentiated between spheres of action, in recognition of the fact that the need to focus in one area might lead to lower levels of effort – or even the abandonment of a priority – in another area. Foreign policy activity is differentiated between spheres of action, in proportion to the composition of the state’s worldview. A mostly-realpolitik state’s actions will mostly have an impact on the balance of power, for example. As with the issue of leaders and constituencies, above, this is meant to be a starting point for explaining any given case, not an ironclad assumption about the way the world works. As such, it struck me as the most sensible general assumption, but again, I am open to others. Horowitz also asks why success eventually leads to backsliding — the eventual reversal of successful outcomes — rather than to gradual reduction in success and stasis. Simply put, it should not. Horowitz’s intuition of how the model works is precisely correct here: if we hold worldviews and capabilities constant, a state that is achieving success in the international system should achieve less and less of it until an equilibrium point is reached. If I gave the impression that the model worked differently, I regret having done so. The theory’s utility is debatable. The tests are less than conclusive. The microfoundation may not be very compelling for all readers. But these are hardly fatal problems. They give us something to think about just as they press readers to see if their perceived flaws can be improved upon. It’s much easier to hit pitches the greats never even swung at–can you believe how little guidance extant lit offers when it comes to piracy off the coast of Somalia? Or the use of Twitter bots to sway public opinion regarding immigration?–than to score runs off curveballs they were lucky to catch a piece of. Yet, every once in a while, someone swings for the fences. Tests on observational data are, of course, never conclusive, nor should we take them to be. One can only hope for two things: one, to reach the frontier of knowledge at a given point in time, and two, to have that effort be superseded later on by engaged, thoughtful, and hardworking scholars who take it as a foundation for their own research. While I do not always agree with these reviewers regarding which areas are the most useful avenues for future research, I can hardly disagree that such avenues exist, and I hope that this roundtable has lighted the way toward them. Alexander Wendt, Social Theory of International Politics (Cambridge, 2000); John J. Mearsheimer, The Tragedy of Great Power Politics (Norton, 2001); Charles L. Glaser, Rational Theory of International Politics (Princeton, 2010); Nuno Monterio, Theory of Unipolar Politics (Cambridge 2014). Kenneth N. Waltz, Theory of International Politics (Addison-Wesley, 1979). [This reference appears in Braumoeller’s book and is included as part of the original quotation – ed.] William C. Wohlforth, The Elusive Balance: Power and Perceptions during the Cold War (Ithaca: Cornell University Press, 1993). The Gulf: The Bush Presidencies and the Middle East. (Lexington: University Press of Kentucky, 2012). Presidents, Kings, Dictators, and War (with Allan Stam and Cali M. Ellis). Book MS in progress. See, e.g., The Great Powers and Global Struggle, 1490-1990 (Lexington, KY: University Press of Kentucky, 1994), with Karen Rasler. Colin Wight, Agents, Structures and International Relations: Politics as Ontology (New York: Cambridge University Press, 2006), 1. Alexander Wendt, “The Agent-Structure Problem in International Relations Theory,” International Organization 41:3 (1987): 335-370. Michael F. Cairo, The Bush Administration and the End of the Cold War: A Belief Systems Approach. University of Virginia. 1999. See Michael F. Cairo, The Gulf: The Bush Presidencies and the Middle East (Lexington, KY: University Press of Kentucky, 2012). Stephen Earl Bennett, Richard S. Flickinger, John R. Baker, Staci L. Rhine, and Linda L. M. Bennett, “Citizens’ Knowledge of Foreign Affairs,” The International Journal of Press/Politics 1:2 (March 1996): 10-29. Bear Braumoeller. 2008. “Systemic Politics and the Origins of Great Power Conflict.” American Political Science Review 102(1): 77-93; Bear Braumoeller. 2006. “Explaining Variance: Or, Stuck in a Moment We Can’t Get Out of,” Political Analysis 14(3): 268-290; Bear Braumoeller. 2004. “Hypothesis Testing and Multiplicative Interaction Terms.” International Organization 58(4): 807-820. Michael C. Horowitz, Rose McDermott, and Allan C. Stam.,”Age, Regime Type, and Violence” Journal of Conflict Resolution, 49:5 (October 2005): 661-685, and Michael C. Horowitz, and Allan C. Stam, “How Prior Military Experience Influences The Future Militarized Behavior of Leaders,” International Organization, 68:3 (June 2014): 527-559. Constituents are citizens who can exert pressure on the state’s leadership, regardless of the regime type. At one point, for instance, Braumoeller introduces “sympathetic” and “antagonistic” states (allies and rivals?) to better distinguish responses from other states. On this score, Braumoeller introduces another twist by differentiating between latent and real capabilities. Much the same might be said about British liberalization in the early nineteenth century and Mikhail Gorbachev’s movement away from Cold War confrontation in the latter twentieth century. Somewhat irritatingly, Braumoeller references to other arguments mix paradigmatic frameworks and real theories. Philip E. Tetlock, Expert Political Judgment: How Good Is It? How Can We Know? (Princeton: Princeton University Press, 2006. Philip E. Tetlock, Michael C. Horowitz, and Richard Herrmann, “Should ‘Systems Thinkers’ Accept The Limits On Political Forecasting Or Push The Limits?” Critical Review 24(3) (2012): 375-391.